How would you use the Okanagan Rail Trail? Vernon Morning Star’s article of August 31 sheds some light on the trail's current status. 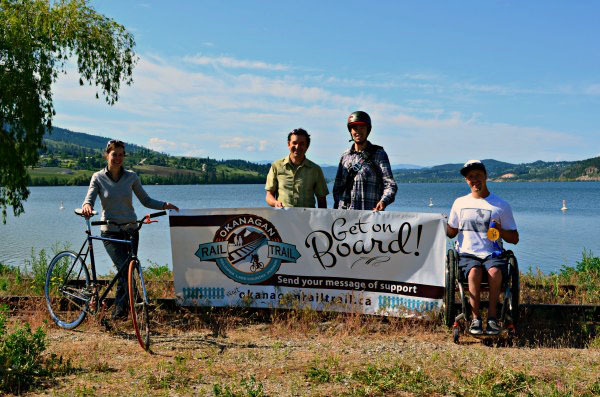 If you are interested in supporting this initiative, you can add your voice via the Okanagan Rail Trail website. The proposed trail would run from Vernon, through Coldstream, along the lake to Oyama, and through Lake Country to Kelowna. The total distance is estimated at 205 kms and the elevation grade is less than 2%, so this trail would be ideal for all ages and abilities, as well as all sports: walking, biking, skiing, etc. The Okanagan Rail Trail Impact Assessment suggests that the development of this trail will improve the quality of life for those living in the area by providing an attractive, safe and accessible place for people to enjoy fitness and the outdoors. Also interesting to note if you are considering buying or selling a home in this area, is that this report also states that it will increase property value in the area because two-thirds of homebuyers consider the walkability of an area when looking at homes. Vernon and the surrounding area already has a lot to offer in outdoor spaces and trails, but this proposed rail trail would bring a lot of attention - similar to the Kettle Valley Trail further south - and would support more tourism and jobs for the area. I think that adding this attraction to the area would be a positive change. Vernon and the Okanagan are always adding little bits and pieces to make it a little more wonderful. If you would like to know more about what it’s like to live in this fantastic place in British Columbia, then give me a call - I would be happy to share my insights with you, or of course find you a home in the area!